The now-infamous doctor and state Senator who co-sponsored and pushed through SB277 has introduced a new piece of legislature. On December 5, 2016, he brought SB 18: Bill of Rights for Children and Youth in California to the Senate floor. This bill is in its early stages, with only two short sections written in. And, it’s not expected to be enacted — if passed — until 2022. But the language of the bill is very, very problematic, and you should be very concerned. Make no mistake: take action against this bill immediately, if you are in California. If you’re not in California, be sure that no similar bill is introduced to your state — consider writing to your representatives now, to tell them you would not support the creation of such a bill and why. I’ll share additional action steps at the bottom of the post. First, though, I’m going to go over the bill, line by line, and explain why you need to worry. Let’s look at the text of the bill, line by line. (If you want to read the full text all at once, it can be found HERE). Existing law provides for the care and welfare of children and youth in various contexts, including, but not limited to, child welfare services, foster care, health care, nutrition, homeless assistance, and education. This is the bill’s very first sentence. If existing law already provides for child welfare in so many ways, then we do we need an additional law to cover the same things? The only reason we would need such a law is if they were planning to expand or re-define the parameters — or shift the focus of control. Assembly Concurrent Resolution No. 80 (Res. Ch. 101, Stats. 2009) declares the Legislature’s support of a Bill of Rights for the Children and Youth of California that resolves to invest in all children and youth in order to achieve specified goals to create an optimal environment for their healthy development. This bill would declare the intent of the Legislature to expand and codify the Bill of Rights for Children and Youth of California to establish a comprehensive framework that governs the rights of all children and youth in California, outlines the research-based essential needs of California’s children, and establishes standards relating to the health, safety, well-being, early childhood and educational opportunities, and familial supports necessary for all children to succeed. The bill would declare the intent of the Legislature, by January 1, 2022, to enact legislation for the purpose of ensuring that the Bill of Rights for Children and Youth of California, in its totality, is applied evenly, equitably, and appropriately to all children and youth across the state. What exactly is a “comprehensive framework?” That sounds like a government-controlled and implemented program, not a protection of families’ rights or empowering families. “…research-based essential needs…” Whose research? What essential needs? Does it matter to them at all that up to 90% of all published research is poorly done or outright fraudulent? Why would this be the guidelines and structure upon which they are basing things? Does their research account for all of the differences in family structure and culture? What kind of flexibility is there? “…establishes standards…” Again…what standards? It sounds like they are trying to enact a one-size-fits-all program here. And we all know that those simply don’t work, because people are not the same. “…applied evenly, equitably, and appropriately to all children…” Sounds great in theory. But, again, what if people don’t have equitable needs? This doesn’t seem to account for that. And this is just the introduction…. What exactly is “special care” and why are children entitled to it? Do their parents not already provide this “special care,” owing to the fact that they are immature and may not know what is in their own best interests? What is their “best interest,” and who gets to decide? What if the state’s definition of “best interest” is not the same as the parents’ definition? Do they get different caregivers, until or unless the parents comply with the state’s standards? Sounds great — are they going to leave families alone, then, outside of actual egregious abuse or neglect? How do they define this? How can they ensure this? The best chance at social and emotional well-being is to keep families intact and keep the state away, until clear abuse/neglect is occurring. Cognitive development apparently refers to education, so we can assume all of this point does. Most likely, the state defines “optimal cognitive, physical, and social development” as occurring within the public school system. Pan has not been shy about his opposition to homeschooling, and this point may be used to remove or severely restrict the right to homeschool. Appropriate, quality education? Most likely, again, within the public school system — leading to loss of homeschooling freedom. Who gets to decide what is “appropriate, quality health care?” Based on Pan’s beliefs and actions thus far, we can only assume that he believes that whatever the allopathic/mainstream system is doing, is what is appropriate and quality. Refusing vaccines, choosing herbal remedies, etc. would not be allowed and parents could potentially be prosecuted if they choose care outside of the mainstream system, based on this point alone. (b) It is the intent of the Legislature in enacting this act to expand and codify the Bill of Rights for Children and Youth of California created by Assembly Concurrent Resolution No. 80 (Res. Ch. 101, Stats. 2009), to establish a comprehensive framework that governs the rights of all children and youth in California, outlines the research-based essential needs of California’s children, and establishes standards relating to the health, safety, well-being, early childhood and educational opportunities, and familial supports necessary for all children to succeed. This point basically sums up what they’ve said so far. This law doesn’t do anything, except give them permission to create standards and programs to enforce those standards. We won’t know exactly what they’re going to come up with or to what extent they’ll enforce them until after this law is passed. It is not acceptable to pass a law like this that has such vague and sweeping implications with poorly-defined parameters. Especially not in California, where parental rights have been stripped increasingly over the last 5 years. (a) Develop and put forth research-based policy solutions that will ensure the Bill of Rights for Children and Youth of California, in its totality, is applied evenly, equitably, and appropriately to all children and youth across the state. (b) Determine the amount of revenue and resources necessary to ensure that the Bill of Rights for Children and Youth of California, in its totality, is applied evenly, equitably, and appropriately to all children and youth across the state. Basically, this allows them to change the state’s budget, increase taxes, create new departments, hire new personnel, and do whatever they think is necessary to enforce whatever laws they come up with. (c) Identify and obtain the revenue and resources necessary to ensure that the Bill of Rights for Children and Youth of California, in its totality, is applied evenly, equitably, and appropriately to all children and youth across the state. This is basically the next part of part (b), ensuring that they have the funding and personnel to enforce their law. In theory, this sounds great. Yes! Let’s protect the rights of children! Let’s keep everyone safe, let’s give everyone equal opportunities, let’s take care of our most vulnerable citizens. But, it’s extremely problematic to allow a very small group of people to decide what constitutes “best” for an entire group of millions of families. Why do these people get to be the ones to decide? What if they don’t know or understand (or want to understand) those families’ perspective and needs? We know that Dr. Pan believes he knows better than families, and his supporters believe the same. That is serious, for people who believe that individual families are almost always the best people to make decisions for their children. But the biggest problem with this proposed law is its utter vagueness. It actually doesn’t do anything at all, in and of itself. What it does is allow them to create lots of other new laws, programs, taxes, or whatever they want…and enforce it. Sure, you could ignore this law, and fight each more specific law or program put in place — if given the chance. (Some won’t even be up for discussion, since this law gives them freedom to create those things.) But, it’s unlikely that those fights would prevail with a law like this on the books. If you value your freedom, do not let any politicians put vague laws like this on the books. Especially not politicians that have a history of stripping parental rights in favor of government control! Contact your California state senator (if you are in California) and tell them that you do not want them to vote for this bill. Make it clear that if they support it, you will campaign against them in the next election. Join this group to help recall Richard Pan and remove him from office immediately. He’s made it clear that his attack on parental rights is not going to stop, so he does not deserve to keep his job. Share this post, so that more families are aware of what’s in this bill and can help join the fight. We need to get the word out quickly so that people can get involved. Tell everyone, everywhere that this law is dangerous. It’s not about protecting children, but about allowing the state to define what children need and to force parents to comply — for fear of losing custody if they don’t. Seems to say nothing about what needs to be corrected….still. I have three kids with intact marriages and families who are each raising their kids in slightly different ways. I agree with some and have questions about others. But the grandkids are loving and respectful to us. They have their goals and are working towards them. They also have the respect of many others. While each make us proud it is in different ways that would not fit their siblings, much less fit the other grandkids. Legislated mandates do not promote the welfare of everyone. Someone close to the people must make the decisions. Even grandparents are on the ragged edge of being appropriate for day to day decisions, the state is even more so by a few orders of magnitude. My daughter-in-law graduated earlier this year from the same med school attended by Dr. Pan. I could barely stand to listen as the speakers lauded Pan and other physicians who used public platforms to push agendas of allopathic medicine (which are little more than the agendas of Big Pharma). They see themselves as entitled to do so because they are M.D.s, much wiser than we, and more than qualified to tell us what to do. The arrogance and condescension with which they view the public’s tendency to do internet research about their own health issues is appalling. We are not to think for ourselves, but let them tell us what is best for us. Thus, you have these outrageous, liberty-killing bills and the trusting, childlike mentality of people who blindly accept being told what to do with their bodies and those of their precious children. It is horrifying. 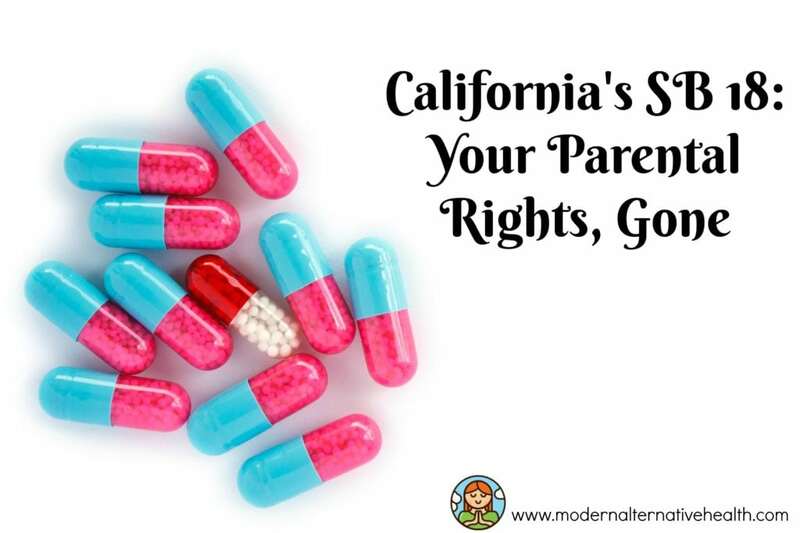 Californian Senator Richard Pan pushing to outlaw parental rights in all medical decisions | ACGR's "News with Attitude"
Do you know what’s going on with this bill currently?